Over the last 9 years I've worked exclusively with VLF receivers and Antennas as a hobby and am continually improving them. The one problem I notice the most is a tremendous amount of weak signal that tape recorders just don't have the dynamic range to save. My old ears can still hear a lot of signals down near the noise floor that I find particularly interesting. My receivers do a fine job of providing them to listen too but again they are so weak the experience is not saved on tape to listen to or investigate further. I'm talking about whistlers, risers and chorus right down in the noise. They are there nearly all the time and I finally got the pleasure of recording some of this information using my laptop computer. This was made possible by downloading Total Recorder Standard Edition online for about $18 USD. You can find them quickly at www.totalrecorder.com and investigate their available programs and decide for yourself if the benefits far exceed the cost. They certainly do in my opinion. I am using an older Compaq Presario 2100 laptop for recording more than 10 hours at a time using the Total Recorder Program. This is possible by providing a set of three, 6 volt, 12Ahr Gel batteries and a DC power cord. You simply wire the three batteries in series for approximately 20VDC and obtain approximately 12 hours run time with a 1Ahr current drain. I have also operated one Dell Inspiron Notebook the same way and made the power cord for it as well. Note very well here that you are not likely to find a DC cord from any manufacturer. I was fortunate with the Compaq in that it uses a standard Jack/Plug combo available from Mouser: www.mouser.com Suffice it to say here that this is not for the meek or in-experienced. Any incorrect wiring done or modification I may describe is the responsibility of the one performing the work. Introducing a 20 volt 12Ahr Gel supply incorrectly to your Laptop/Notebook may prove fatal to the device. Be aware of this and pay careful attention to details if you are going to follow my example. Remember this has worked perfectly in both my experiences because I am fairly knowledgeable in such work. Your results may indeed vary so if not sure please get some professional help. The simple facts are these: Laptops are designed to operate off the local 120 or 220 Volt AC power systems available over much of the planet using an AC adapter both for home operation and to charge the internal battery. A common Laptop supply voltage is around 19 Volts DC. The good news is you have most of what is needed already. All that is left to provide is a secondary set of plugs and jacks to assemble a power cord that does both external DC supply by Gel batteries and still connects to the AC adapter for home use. The job requires cutting off the DC output cord some 4 to 6 inches from the AC adapter and installing an inline DC power Jack specifically capable of handling the necessary voltage and current. Then install a mating power Plug on the remainder of the original power cord. You must not attempt to use miniature or hobby type DC jacks rated at only a fraction of an ampere or rated below 18 to 20 volts DC use. Keep in mind I am going to describe what I used to effect a reasonable conversion fully capable of handling the voltage and current involved. My Laptop has a measured current demand of just over 1.3 amps at 19.7 volts DC with the display active and drops to 850 mA with the display off. The Dell required more current at the same voltage. The beauty here is that three 6 volt Gel batteries will supply the operating voltage in my case for more than 10 hours of constant recording. With the added benefit of improved dynamic range and digital audio processing I am now able to record sounds that have never made it to tape. My dreams are beginning to come true indeed. I chose XLR gold pinned Plugs and Jacks since they are available in a variety of pin-outs all with the ability to handle the voltage and current requirements. They also provide built-in strain relief for the cord and pigtail on the end of the AC adapter and are self locking to mating Inline or Chassis Jacks. Use something else if you are certain it's up to the job but err on the side of more than enough rather than less than enough so you don't come to grief. Also be absolutely certain of your AC adapter's voltage and current capacities as well as the Plug/Jack wiring polarity. So far I've only encountered the center being positive and the outer barrel negative. Again your results may vary. Be sure or be very sorry. Plugging a Gel battery supply wired backwards into your Laptop will certainly destroy a lot of Electronics and may set a fire as well. Use good techniques, equipment and skills and above all if you can't do the job yourself get help. After determining what Plug/Jacks to use and cutting off the AC adapters DC power cord approximately 4 to 6 inches from the supply itself you will need to wire on the new inline DC Jack to the end of the Adapter. Note what pins of your new plug and jack are used: mark this information down and follow through when wiring the Plug on the remaining cut-off DC supply cord. For XLR use I recommend a simple convention: Lowest pin number 1 for ground/negative. #2 for lowest voltage desired. #3 for next highest and so on. I happen to use 4 pin XLRs so have 6, 12 and 18 volts available any one at a time and use matching plugs wiring to the Battery pack for the voltage, polarity and plug needed to power a wide range of equipment. By this method you will be able to plug the new matching inline DC Plug back into the AC adaptor so the Laptop will operate off it normally at home and also power your Laptop in a Mobile Environment with the same modified cord. 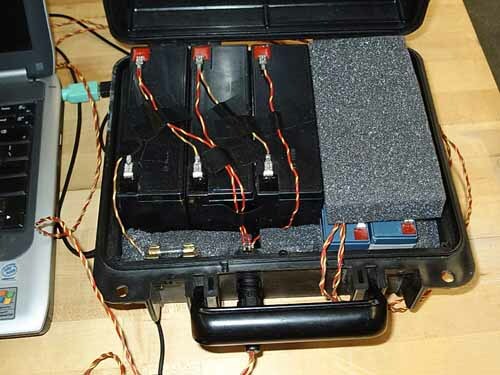 I setup a handy battery box I purchased from Mouser to hold my three Laptop batteries and two 12 volt Gel batteries to supply my Receiver. I installed a matching XLR 4 Jack in this box using the above wiring convention and made up 3 cords with an XLR 4 Plug and new cord to a Plug matching the Jacks on a multitude of portable products including tape recorders, receivers and Laptops. My choice was one of the SERPAC R series equipment cases. These are very rugged plastic boxes and available in sizes to accommodate quite a number of Gel batteries. Take a look at my photos to get an idea of what I'm doing. Final note: Buy three new 6 Volt 12Ahr Gel batteries and chargers and setup a system that will last for years. Recharge batteries immediately after use to give them the longest life possible. 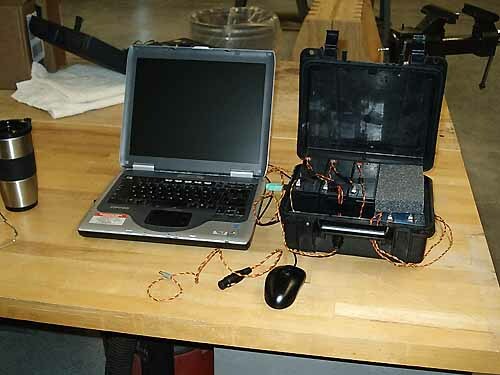 The Laptop will have regulators onboard that will handle the approximately 20 volt full charge of three 6 volt Gel batteries but they will drop out at some level around or below 18 volts and full discharge of the Gel cells. This point is when the internal Lithium Ion battery will take over and I recommend you install a new one if your Laptop battery is more than a few years old as it won't last long recording after the Gels discharge. An hour or so is reasonable. In any event as I described earlier my Compaq 2100 has easily made 10 hours before recording was stopped using the Total Recorder program. At the end of 10 hours the green charge LED switched to yellow to indicate the Gel supply was no longer charging the internal battery. You can operate another hour or so if needed. Pay close attention to details. Choose good Jacks and Plugs. Do careful wiring and test your results fully before going afield to record. Measure everything twice and write it all down. Polarity and pin-out really count so do it right the first time and use the best Plugs and Jacks you can find. The XLR system is very satisfactory and Mouser and others will have them in 3, 4, 5 pin to solve about any supply problem you can come up with plus do it in style. The Gel battery supply and Total Recorder do an incredible job providing a very long time hands free recording system. The choice of recording format will determine the file size verses length of recording time. I recommend using the largest Hard Drive possible or transfer saved files to CDs or DVDs as Data Files after every recording session. Very high or CD quality recordings in PCM will eat up a lot of space. Just be aware of this when planning your next move. Remember when a 20 Gig hard drive seemed huge? Not anymore. Something on the order of 80 Gigs is a lot better so do what you can and update your Laptop as necessary. I am not affiliated in any way with High Criteria or Total Recorder. This information and advice is totally free for all to use. It has benefited me greatly and I hope it does the same for you. Do yourself a big favor and have a look at Total Recorder as soon as possible. www.totalrecorder.com You will find all the information necessary to do a wide variety of sound recordings and conversions. Their Readme file indicates that Windows 98SE, Windows 2000, ME and Windows XP operating systems can be used to run TR. You will be able to record sounds from many programs like RealPlayer, Windows Media Player, ITunes, Musicmatch Jukebox, Winamp and Internet telephony programs or record from a microphone or line input. Convert sound input to any supported format on the fly or after recording converting from one format to another. There are many more possibilities plus add-ons such as sound restoration of vinyl or tape recordings, work with speech, normalize recordings and apply an equalizer. The list goes on. TR offers recording in uncompressed PCM format, MP3, Windows Media Audio and Ogg Vorbis to name a few. One of my favorite features is TR will open wav files well over 2 Gigs in size and play them for you when many Windows Media Player programs will only complain about buffer size. An audio sample, saved with total recorder ad post analyzed with Spectrum Lab. You will also be able to cut and paste files of any size from Total Recorder and save them anywhere you like named as you like and all without destroying the original full-time recording. Realize it is absolutely possible to damage your laptop sound card microphone input stage by over-driving it. I highly recommend that you reduce the recording level output from your receiver to its lowest level before connecting to your laptop and engaging TR. Then have a careful look at the level meter to ensure you are not overdriving your sound card input as you begin to advance the receiver audio output. Carefully beginning in this fashion will prevent damaging your sound card. Once satisfied that TR is registering your VLF signals you engage TR by clicking on its Red record button in the TR display and Recording begins. Another source of trouble may be a muted input on your sound card. Be sure to look around your computer for problems like this and remember to contact High Criteria for help if needed. They were most beneficial when I began using TR and they will be for you as well. Now to assist in longer operation you may also want to open your Power Options Folder and select shutdown of the display as soon as possible. This can save half an amp or more current expended. One can also close the laptop and accomplish similar results. Note here that the Hard Drive has to be selected to: "Never shut down". If not it may go to sleep during your recording process. Presentation is the setting I selected for my Compaq. Another important feature on my Laptop that the Dell Inspiron didn't have is a duplex sound card. The Presario has such a card and that makes it possible to listen to the sound card while recording. It's not 3rd head proof like some high quality recording systems but if it's making it through the sound card when you hit the Total Recorder Record symbol then you at least have an extra headphone monitor to listen too while recording as well as a level control on the output. Also the Display in the Recording box will give a relative reading of recording level in either Mono or Stereo format. If you do not have a duplex sound card you will have to monitor from your receiver output during recording. In any event you are not listening after recording: only monitoring what you are recording. It won't take long to work these things out. Total Recorder has a handy wizard to setup desired recording parameters. It's a very good program from the basic Standard Edition up through the more professional recording programs available. It is hoped that you will at the very least investigate this for yourselves and see if TR meets any of your current needs. TR is certainly doing a great job for me collecting data now that has never been captured in tape recordings. The folks at High Criteria are also able to provide a great deal of support. If you have questions just ask them. Simply put: with a Laptop, Gel battery pack and Total Recorder you will be able to go to the field and record for many hours continuously and in a wide variety of formats which you will discover quickly for just a look at TR. The continuous operation will prevent missing any signals happening during your outings such as falling asleep during recording or missing a great whistler when you are changing tapes. Also and of even more importance is the dynamic range improvement available by using a Laptop for your recording medium. Even a Microphone input on your laptop will provide a far wider dynamic range than a typical tape recorder. Note here that a Laptop having a sound card with a Line Input will give even better dynamic range. Possibly as much as 20db greater range over a Mic input. My own experiments have proven that signals never appearing on tape recordings are now being recorded on my Laptop and are also easily downloaded or modified with Total Recorder. CDs or DVDs of entire operating sessions can be burned at will. Sample files can be cut out of the continuous recordings with TR and saved for whatever purpose you might have. 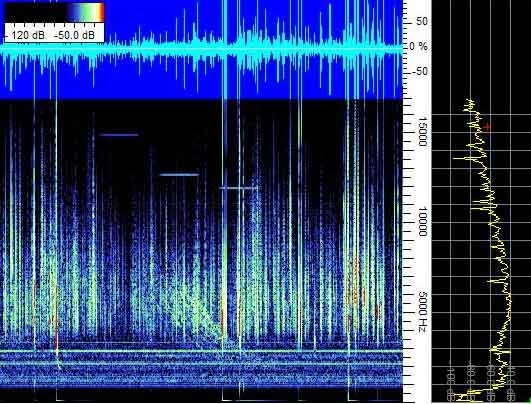 Wav files are an easy possibility to use and interface with Visual programs like Spectrogram and others directly for viewing or further processing. See www.visualizationsoftware.com Any size file can be extracted from TR without damaging the continuous recording. The information to use Total Recorder and process recorded signals is very complete and being updated all the time. There are Professional use programs available online from High Criteria to buy and download and a free download to experiment with before buying, but, you must understand it comes with an injection of noise periodically to your recorded sounds so only buying the registered program will remove that noise source. Get online and have a look at High Criteria's products and at least experiment with the free version and see if you like it as much as I do. The Standard Edition is $18 USD. The larger more robust programs of course are more expensive. Over the years I have heard signals so weak and amazing I have just kept quiet about them. Now I am gathering proof that they exist using Total Recorder. Signals well down in the noise and below tape recorder threshold are now being saved for further examination and being digital in nature have no apparent finite lifetime as does a tape medium. If you have any questions please feel free to contact me (see at: http://www.vlf.it/directcontact/directcontact.htm) and be sure to check out www.totalrecorder.com as soon as possible. Many thanks Brian for your continued support. I invite anyone who is interested to feel welcome to contact us and share in good times and findings. I wish you all the best success in your own personal endeavors. The PMD671 comes with an AC adapter for home use that provides 15 VDC output with a commonly available Plug. Also comes with a battery holder for 8, AA, Alkaline batteries or you can run Nicad or Lithium-Ion battery packs and use the AC adapter to recharge them. Other accessories are also available. The Guide indicates around 5 hours or more operating time on batteries. Not bad but not as long as I like to record. 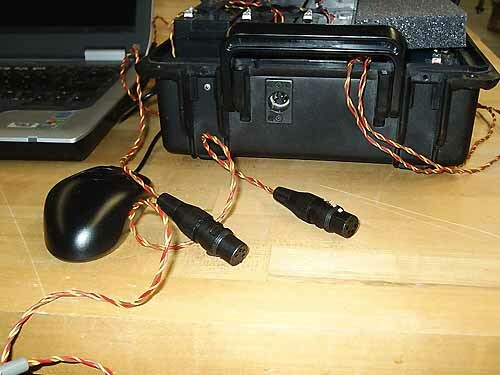 Remember the SERPAC-R Battery Box I setup for my Laptop? Yup: made a patch cord to connect the first two series pair of 6 Volt Gel Cells on the XLR-4 Jack in my Battery Pack right into the PMD671 DC power Jack. (13.32VDC after a full charge) Mouser and others carry both the XLR-4 parts and the 2.1mm Plugs for the Recorder. Very easy to make your own DC power cord. Remember to wire the correct polarity and voltage and maybe include some fusing to protect things. These Gel batteries can and will destroy equipment if not connected properly. Pay careful attention to every detail. If you look close in one of my photos from the Laptop piece you can see there's a fuse inside the case and it's wired to the negative output of the 3 series batteries to the fuse block and through there to Pin 1 on my XLR-4 Jack. It provides protection to all the devices I power from my Gel Pack from 6 to 18 VDC. So far I’ve used these batteries to power the PMD671 up to 11 hours continuously on a full charge. (3.5 Gig file size) Eventually I’ll take the time to find out how far a full charge will go. Hopefully right to the end of the 4Gb CF card. You can also parallel two or more 12 VDC/7Ahr Gel batteries for longer recording time if needed. Figure almost 6 hours for each battery paralleled with a load under 1 amp. The actual discharge rate determines the time limits. This is close enough to get started. Remember to parallel 12 Volt batteries; not series. (12 VDC at higher current capacity equals more recording time) Always recharge Gel batteries immediately after use to prolong their life. When you study the User Guide you will be truly amazed with the excellent performance this little recorder offers. It's comparable in size to typical cassette tape recorders but offers features and performance no tape recorder has ever been able to provide. Understand the price is significantly higher than most tape recorders: starting at $700 but for what it can do even the most expensive Laptop or Tape machine is no equivalent. DM Pro even offers two microphones free with the purchase of a PMD671. I am not affiliated with either Marantz or DM Pro in any way. This information is only for your benefit and be aware the Microphone deal could end at any time. The following information is right off the Marantz Professional data sheet or User Guide for the PMD671. Check out the Data Sheet and User Guide. There are far more features and information available. If you download the whole Guide you will find an enormous amount of information on using and programming the PMD671. I have only touched the surface here. There are several earlier versions and one is a small hand-held recorder that is more economical but a careful look at all the specifications will prove that the PMD671 is the recorder to choose: Dynamic range is the feature that beats all others in recording. I'm sure we will see more Digital Recorders in the future possibly at lower prices but don't count on that. When mine arrived I programmed it to record CD quality audio. I couldn't be more pleased with the results. Everything that you can hear live is all there right down into the noise floor in recordings. If your receiver is capable of making the signal audible the PMD671 will record and reproduce it. I'm hearing sounds reproduced now that are not found on any tape or Laptop recordings and for a very good reason: Dynamic Range. If you find something better give me a holler or write a report on it. I would very much like to know what it is and who makes it. My best regards to all who are interested in VLF systems and recording. Please go online and have a look at the PMD671 Data Sheet and User Guide. This is one truly amazing recorder. You can reach me at my email address if you have any questions.